Six years ago on this very day I began this blog. It was Thanksgiving of 2012. A lot has changed since then as you might imagine. My post that day in 2012 was about gratitude. In the six years since that post was written I have learned, and experienced, a lot more about gratitude. It’s power to transform how you feel and perceive life. That, in turn, ultimately transforms the quality of your life. I have included a special section on gratitude in my upcoming book Living the Dream. Recently, I read an article that gave me a whole new outlook on gratitude. It including something even more powerful and life altering – being grateful. Today, as we all hopefully are spending at least part of our day focused on what we have to be thankful for, allow me to introduce you to what I learned in this article. It will allow you to take what we observe on this most wonderful of holidays and use it to create a life that is far more rich and rewarding. We tap into the power of gratitude. Gratitude to me should be something that we practice daily. Several times a day as often as we can. Why? Because the more we practice gratitude the better our life becomes. The definition for gratitude is to be appreciative for all the good you have in your life. You have hot water? You have electricity in your home? You have a job to earn a living? You can express gratitude for all of those things. Trust me when I tell you there is always something in your life to have gratitude for. You may be so out of practice in looking for the good it may take you a while to find it, but it is there. When you start looking for good things in your life they start to become easier to find. This, in turn, causes an increase in good feelings. What does an increase in frequency and intensity in good feelings get you? A more enjoyable life. That is where a lot of people stop, and that certainly is a great state to be in, but there is something better. Grateful. How is being grateful different from expressing gratitude? Being grateful does not depend on good things happening to you. Remember our examples above? Let us take a another look at them? What happens if your hot water goes out? Being grateful means you understand what a blessing it is to have hot water as a normal circumstance and being without is a great reminder. Being grateful means you are still thankful that the water is clean and you have means in which you can heat it. Electricity go out? Being grateful means being thankful not only that it is usually available, but there are hard-working people on the job 24/7 to help get it back on track. Your job not what you like? Perhaps you even lost your job? Grateful is a chance to improve your budgeting skills and yourself while you pursue something that will bring you spiritual as well as monetary fulfillment. If that last state sounds a bit like looking at the world through rose-colored glasses, it kind of is. Do yourself a favor and imagine what your life would be like if you were able to find joy and the good in life no matter what the outside circumstances were? You would be in a state of bliss most of the time! What would that give you? One hell of a great life. Trust me when I tell you I know this isn’t easy. I am working to develop a feeling of being grateful in my life. What a goal to pursue. Everyday I become closer to being able to appreciate the joy in life even in the toughest circumstances. That does not mean there are not days in which I falter. We will all have them. The sooner you get them out of the way, and the more you learn from them, the closer you will be to living a life feeling grateful. As you observe this wonderful day of thanksgiving, begin to ponder how you can foster that feeling more often. I suggest starting with having gratitude for all the good that comes in your life. Taking a moment and appreciating those things. Then strive to feel grateful even in the face of challenges. Celebrate the fact you are alive every day to experience all the world has to offer. There is even beauty in pain. When we arrive at the state in which we can experience that, life becomes a state of magic. Are you one who ‘talks the talk’ or do you ‘walk the walk’? As we approach my favorite holiday and begin to focus on what we are grateful for, let us think of this quote. Let us show our appreciation not just in words (although I encourage everyone to do that as well) but in actions. Let us not just speak our gratitude, but show our appreciation through our actions too. Grateful for first responders? Make sure we are pulling over to let them pass and driving slow when we drive past them. Grateful for someone in your life? After you tell them, make sure to do something to show them as well. This is not just for Thanksgiving, but all year. If you were to print this list out and hang it on the bathroom mirror it would be a great way to start the day. In every day if we look hard enough we can find something to feel blessed, grateful, excited, thankful and happy for. Even if the world seems to be crashing down around you, which I know can happen, it is good to get into the practice of doing this. Here is what I suggest. Print this out, or write it down. Place this somewhere you go every morning. The bathroom mirror is an easy idea because most people visit that room before they begin their day. Then ask yourself the questions, “What do I feel blessed about today?” “What am I grateful for today?” “What am I excited about today?” “What am I thankful for today?” and finally, “What am I happy about today?” Do your best to come up with answers for as many of the questions as possible. Do this every day. Make it a habit. Try this for 30 days and see how much better you feel. Click below to watch my YouTube video with a personal message of thanksgiving! Have a happy and healthy holiday! Yes, you are about to witness another post involving the Wisconsin State Fair. It is my favorite place after all. Even while ‘on vacation’ I still notice things that we can all gain motivation from. Take the example in the two pictures above. I found this display behind one of the barns housing animals. It was a place where the people exhibiting their animals could thank those people who helped them on their journey to the fair! A lot of the signs you could tell were composed by young people. What a great lesson to teach these children? Instead of focusing on whether or not your pig or cow came in first, to appreciate all the work that went into just getting there. To remind them of the sacrifice of a lot of people made so their chance was possible. Not all parents reading this have children in 4H or FFA, but in any case it is a good lesson to impart. Starting children out in the practice of gratitude early not only helps the parents have a more grateful child, but as the child grows into an adult it will help them to remain focused on what they have instead of focusing on what they lack. What a great gift to give to a child, a tool to help them remain positive even in tough times. There is nothing, in my opinion, that can transform a life for the better than fostering an attitude of gratitude. What if you don’t have any children or what if they are grown adults? The same holds true for friends and coworkers. Helping anyone become more grateful will make their life so much better. It will increase joy and decrease stress. A regular reminder of what we all are grateful for will help us all. What a great conversation to have as well. I would much rather listen to someone telling me what they are thankful for rather than listening to them complain. Let us all work together to help each other become grateful. Anyone who knows me knows that I believe you should do your best to be who you are deep in your soul. So what is up with the title of this post? Well in case you didn’t catch the picture allow me to tell you. Whether you are a farmer or an artist. Whether you work at a coffee shop or the post office. Whether you are short, tall, black,white or some other beautiful shade we should all be somebody who makes everyone feel like somebody. What does this really mean? Let give you a great example of this in action. There was a class on successful business being given by a man who was a CEO of a successful company. After several weeks the final exam came. When the students reached the final question they were shocked to see it was worth 50% of their grade. The question? What was the name of the cleaning lady that worked until their class began every morning. The point of this was that as a business owner, and dare a day to be successful in any area of life, we must realize every person has great value. If that cleaning lady had not attended to their classroom it would have been filled with dirt, trash, possibly insects and other pests. This weekend take the next two days to stop and offer appreciation for the people you come across. 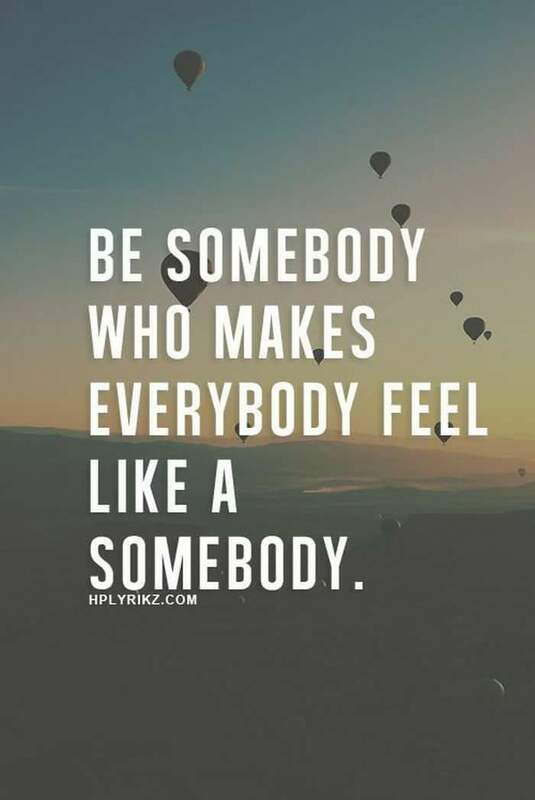 Not only will you give them a good feeling, and thus give yourself one as well, but that is how we should treat each other. Make this an ongoing habit and you will find yourself surrounded by happy and loyal friends in great abundance. Feel free to share this post to inspire others and share your story of showing appreciation in the comments below. What if i told you there was a magic pill that was completely safe and legal? This magic pill would give you an immediate boost of good feelings. It would also improve your outlook on the future. It would improve your relationships and deepen the love and appreciation you both give to others and feel yourself. It would help your goals materialize faster and multiply all you have. In your darkest moments it will provide you with hope. When you are having a great day it will take you to new heights. It will keep you looking and feeling young. How much would you pay for this pill? What if I told you that the pill was free? How far would you look for a dealer? Here is the great news, you have an ample supply of this pill. In fact, you could take a dose of it at anytime. More great news, you cannot overdose on this magic pill. In fact, the more you take the better it is for you! 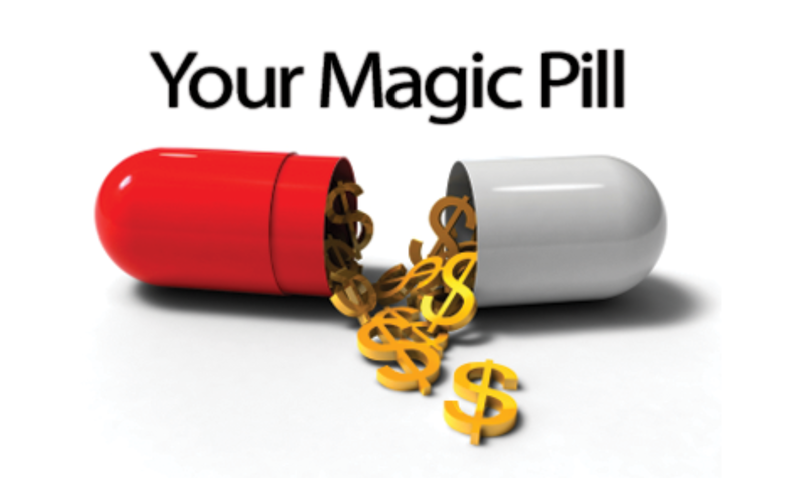 Ok, so what is this magic pill and how can you start taking it? Let me caution you before I reveal what this drug is do not dismiss its power. This drug can be taken in many different forms. The more forms you take the better the effect. Perhaps you think you have taken this drug before, and maybe you have in a very mild dose. Here is what I suggest, take a very high dose of this pill and take it in several different forms. Do so for about a week and see what happens to both you and your life. Ok, this magic pill is actually something we are celebrating today here in the U.S. It is the power of gratitude. Sounds weak? Perhaps you are thinking you have practiced gratitude in the past. You said thank you when someone opened the door or brought you coffee. Feeling grateful for the good in your life is very important and can increase what you receive, but it is merely a great first step. So take that dose. Make a list of 5 things you are grateful for each day for a minimum of 7 days. See what happens. The next dose which will provide you hope in the darkest of times. It will help you rise to the top in the face of chaos and challenge. That is being thankful for even the challenges in your life. Truly if we search hard enough everything has a blessing in it. Being able to find it gives you a super power. The last dose is finding a way to be grateful for your life in general. Just being awake and alive fills you with an almost overwhelming feeling of gratitude. By then you will be unstoppable. You can take this drug in a multitude of ways. The list we discussed is only one. Sharing the drug with others only increases its power. Call a friend just to share what you are thankful for in them. Send out thank you cards to those you appreciate. I can assure you that people are not used to this magic pill and sharing it with them will not only make their day, it may change their life. Don’t believe me? Think of how you would feel if a friend hands you a card that contains handwritten account of everything they appreciate about you. Today is Thanksgiving, which happens to be my favorite holiday. I have to confess only now am I truly beginning to appreciate the true power of being grateful and it is exciting! I invite you to join me. I also invite you to share any ways in which you express gratitude and share the feelings with others. This picture stood out to me for several reasons. 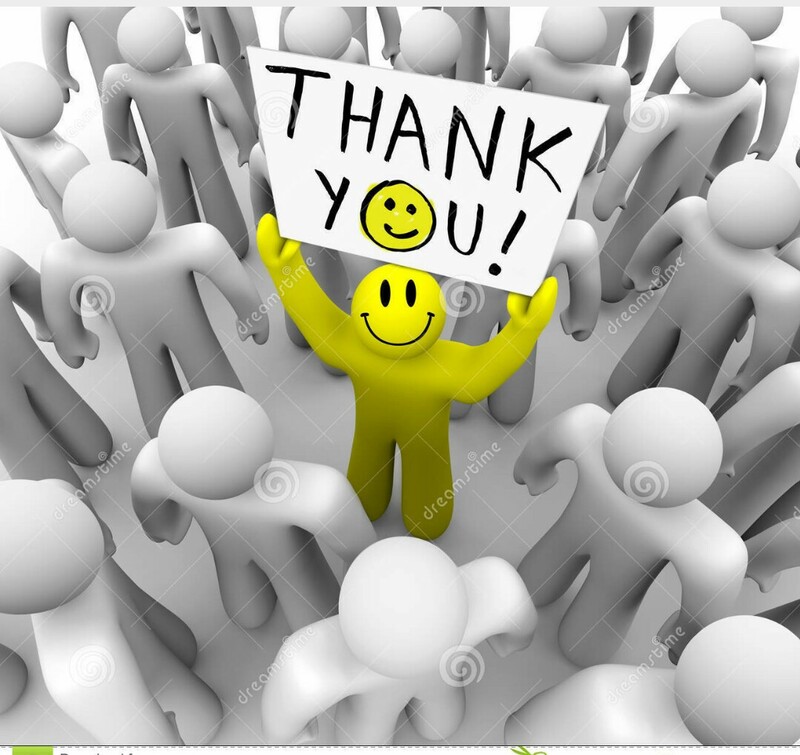 Notice the guy in the middle, he is yellow, he is smiling, he has a sign that says “Thank you” he stands out. This picture is true of how it works in the world. When we are grateful we stand out and separate ourselves from the crowd. Think of how that person that always smiles makes you feel. We all know one. If you wish to stand out from the crowd do something different, be happy, be grateful. Then you will be like our friend in the picture here. I must confess when I first saw this picture and thought of using it as a blog post this is where the idea sat, to stand out from the crowd all we need to do is be happy and be thankful. I even printed out the picture to help remind me of that. I welcome you to print out this blog post and share it with everyone you know. Let us fill the next picture with smiling happy guys saying thank you. Would you like to know a secret? An additional thought came to me while I was pondering how to word this post. How to put this into an application that can be a win/win for yourself and those around you. Take this to a personal level. If you are a parent, try finding one thing a day to thank your children for, even if they happen to be driving you nuts. Try finding one thing a day to thank your coworkers for, even the one that you would rather be without. every time you speak with a friend, try beginning the conversation with something you are grateful for about them. Most powerfully, try this with your spouse. When, at the end of the day when you are laying down to retire try genuinely thanking them for something they did today. Especially if it has been a trying day. Do this for a few weeks and see how things in your life change. How your relationships deepen. I am just starting it myself and will let you know how it works. The title of this post is a phrase I use to close most of my YouTube videos (find them on YouTube under Neil Panosian) and is also a line I must confess to stealing from an Aerosmith song. What does it really mean? Well often something we may forget when searching for that feeling of joy or inspiration in our lives is the easiest way to get that feeling is to give it away. We never know who may be looking to us for their inspiration. You do not have to be an individual who writes or lectures about motivation to be in that category. Although let me tell you it is great to be reminded how much my work touches others. Perhaps you are a person who demonstrates a strong commitment to their faith as my friend Cari does. Perhaps you wish to let your challenges inspire others as my friend Travis does on his site bringitivity Whatever your situation or story may be remember you can inspire others as well. My lady makes beautiful cakes that not only bring joy to others, but serve as an example of the great use people can put their creative skills to. What does all this have to do with me? You might find yourself asking this very question. Perhaps you don’t think you have a skill that can inspire anyone? Think again! No matter what your state or occupation you have the chance to do it with passion and joy. I personally cannot count the times my day has been made better by a cheery face behind a counter, stocking shelves or even cleaning the hotel I am staying at. They have all inspired me. 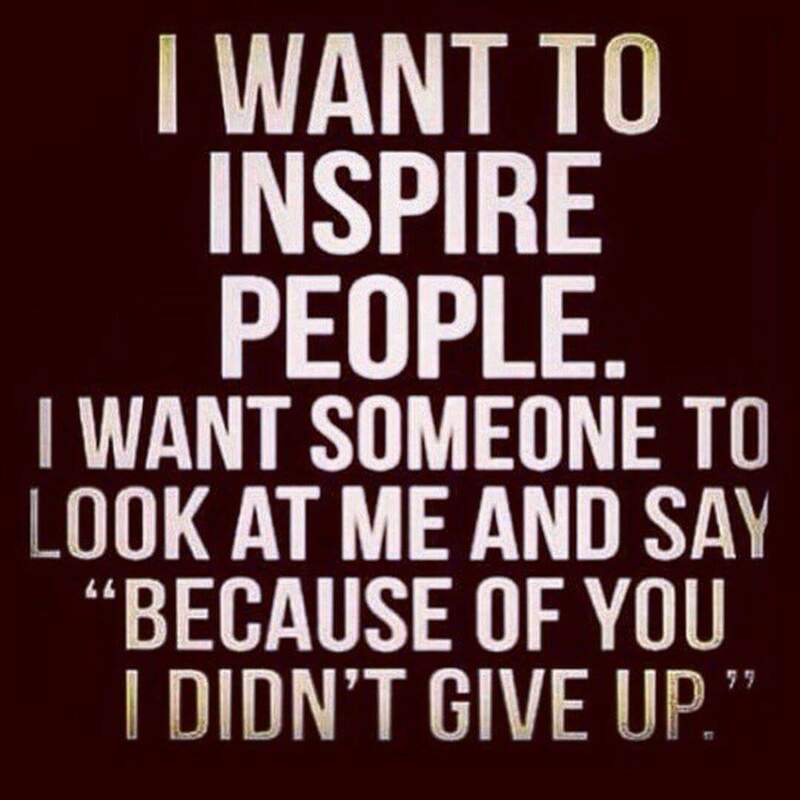 The great thing is it works both ways, I have also had the good fortune of inspiring them. Too many times we may forget or take for granted how important each one of us is. Showing kindness to everyone we meet can be the light at the end of their tunnel. You never know what people may be going through and what they may need. So do yourself and the world a favor, if you can’t find the light, be the light.